Why is it that we talk coaches on the hot seat in college football almost every week but rarely in college basketball? Yes, I know there are about 350 NCAA basketball teams, but I'm sticking solely to the Power 5 conferences - one could argue there are seven in hoops if you include the Big East and American Athletic Conference. Anyways, I do believe there will be one opening for sure in the ACC this offseason: at Pittsburgh. Have you seen how far that program has fallen under second-year coach Kevin Stallings? The Panthers are 0-13 in the ACC and generally are being blown out nightly. That hiring by former AD Scott Barnes was puzzling at the time, and new AD Heather Lyke almost HAS to fire Stallings because fans aren't showing up now, either. That said, Pitt actually has a shot at its first ACC win of the season Tuesday at home vs. Boston College. The Panthers are +8 . Big 12 game at 7 p.m. ET on ESPN. Texas Tech isn't known as a basketball school - but then what school in Texas is? I follow the sport thoroughly, but about the only thing that sticks out in my mind about Texas Tech basketball is when Bobby Knight was there. Former Knight assistant Chris Beard has done a marvelous job in Lubbock, and the Red Raiders are legitimate contenders to reach the first Final Four in school history, not to mention ending Kansas' epic streak of Big 12 regular-season title. 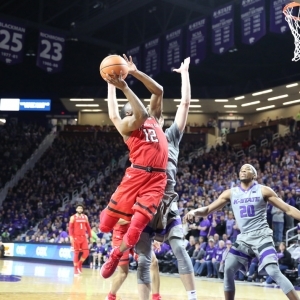 TTU leads the conference by a game over KU, already won in Lawrence and hosts the Jayhawks on Feb. 24 in what should be the Big 12 Game of the Year. The Red Raiders won their sixth straight game Saturday, 66-47 at Kansas State. TTU held K-State to just five second-half field goals while forcing 11 turnovers. During the winning streak, Texas Tech has held opponents to 63.3 points per game. OU lost its third in a row Saturday and sixth straight on the road, 88-80 at Iowa State. Trae Young had 22 points, but it took him 21 shots to get there. He also had six turnovers. Young became only the third Big 12 freshman to score at least 700 points, joining Kevin Durant and Michael Beasley. On Jan. 9, Texas Tech lost at Oklahoma, 75-65. The Sooners outscored the Red Raiders by 12 in the second half and Young had 22 of his 27 points after the break. Oklahoma shot 56 percent in the second half. Young added nine assists and four steals. His father, Rayford, averaged 14.1 points for Texas Tech from 1996-2000. Keenan Evans scored 19 points for Texas Tech but was the only Red Raider to reach double figures. They shot just 37 percent. Key trends: The Sooners are 0-6 against the spread in their past six road games. The Red Raiders are 6-2 ATS in their past eight following an ATS win. The home team has covered seven straight in the series. SEC Network game at 7 p.m. ET. These are two NCAA Tournament bubble teams (both in the field right now per ESPN bracketology) with future NBA lottery picks on their roster: Robert Williams for the Aggies (he would have been a Top 10 guy had he declared last year) and Michael Porter for the Tigers, although he hasn't played since the season opener due to a back issue that required surgery. Porter is hopeful of returning this season, although many NBA scouts say he shouldn't risk it as he'd be a lottery pick regardless. It would be impressive for Missouri to reach the Big Dance without the highest-ranked recruit in school history. Porter's little brother Jontay reclassified into this year's class so he could play with his bro, and Jontay is having a solid year in averaging 8.8 points and 6.8 rebounds. He won't be a one-and-done guy. The Tigers won their fourth in a row Saturday, 89-85 in overtime against Mississippi State. Kevin Puryear, who hadn't made a 3-pointer since Jan. 10, hit a clutch one with 10 seconds left in OT. Mizzou blew a late 12-point lead in regulation. The Aggies won their fourth straight Saturday, knocking off No. 24 Kentucky, 85-74, to get to .500 in league play after starting 0-5. Williams had 12 points, 11 rebounds and four blocks. On Jan. 20, Missouri lost at Texas A&M, 60-49. That was offensively ugly as the Aggies shot 39.1 percent and the Tigers 27.8. It was Missouri's worst percentage of the season and also its lowest point total. Jontay Porter was scoreless on 0-for-8 shooting in 21 minutes. Williams had 13 points and nine rebounds. A&M has won seven straight in the series. Key trends: The Aggies are 4-0 ATS in their past four. The road team has covered five of the past six in this series. ACC game with a 9 p.m. ET tip on ESPN - I'd be willing to wager this is the lowest-scoring game of the night as UVA has no peer defensively and that's Miami's strength as well. Maybe the Wahoos were caught looking ahead to this one as they were upset 61-60 in overtime at home to Virginia Tech on Saturday - UVA still rose to No. 1 in the AP poll (not USA Today) for the first time since 1983. It was Virginia's first conference loss and ended a 16-game home winning streak. Yet the NCAA selection committee has the Cavs as the No. 1 overall seed in the Big Dance as things stand now. The Hurricanes had a three-game winning streak snapped in a 72-70 upset loss at Boston College on Saturday to fall out of the Top 25. UM led by seven but missed its final nine shots. Coach Jim Larranaga never made it out of the locker room due to illness. This is the only scheduled meeting between these schools. Last year, the Canes pulled off a 54-48 overtime upset in Charlottesville - it was 43-all after regulation, and look for a similar score Tuesday. Bruce Brown made a 3-pointer with 23.8 seconds left in overtime; he's one of UM's best players but currently out after surgery on a broken left foot. He hopes to return by the ACC Tournament but it might take until the Big Dance. Key trends: The Cavs are 6-0 ATS in their past six road games. The Canes are 0-4 ATS in their past four at home. The favorite if 5-1 ATS in the past six meetings.